Put critical learning resources at your students' fingertips with an online learning system designed around the needs of today's students. 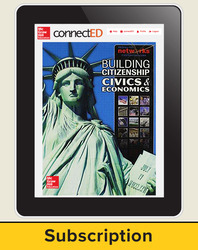 Connect to the Online Student Edition enhanced with interactive activities, media resources, and audio support. Students can check assignments, complete homework and assessments, access the class calendar, and communicate with teachers through the Student Learning Center. Study tools, graphic organizers, and self-check quizzes help students deepen their understanding of class content. The Student Learning Center is a whole new level of interactivity for student engagement.